I have been working on a new book for the past year and I am pleased to report that the final proofs have been checked and the book is now with the printers. The title of this new book is “A Heritage of Colour – Natural Dyes Past and Present” and it is due for publication by Search Press in February 2014. “A Heritage of Colour” differs from my other books in several respects. Firstly, it has a historical slant and one of my starting points was the report on the technical analysis of dyed textile fragments from the Iron Age site at Hallstatt in Austria. The results of this analysis inspired me to carry out a series of experiments which are described in the book. Another feature of this new book is its focus on the use of native and easily-grown or gathered plants. Over 50 plants are featured and the dyeing methods used in the experiments can be used for any plants, not only those featured in the book. 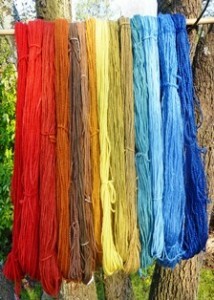 “A Heritage of Colour” also has sections on contact dyeing on fabric using plant materials, dyeing with frozen flowers and creating multi-coloured skeins and fabrics. 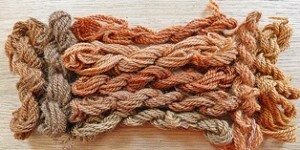 In addition, there are sections on using lichen and fungi for dyeing. The book has over 250 colour photographs, including photos of dyed samples for each plant. The photo above shows some colours from beech leaves and is an example of the photos of dyed samples that accompany each plant. At least one page is devoted to each plant and several pages and photos are devoted to the more significant dye plants. “A Heritage of Colour” has been written with the aim of adding further perspectives to the ancient craft of natural dyeing and I hope dyers familiar with my other books will find within this book much to interest them and inspire them to experiment further with plant dyes. For those new to the craft of dyeing, this book should provide a starting point from which to embark on an exploration of the colourful wonders of the natural world.